A new case study published by Pittsburgh Corning describes how glass blocks were used to help create a more energy efficient, sustainable environment for River Crest Elementary School. Within the Hudson city limits on 40 acres of beautiful, wooded, triangular landscape lies River Crest Elementary. At 93,450 square feet, River Crest Elementary School is Hudson, Wisconsin’s sixth elementary school with a capacity for 588 students in grades kindergarten through fifth. Commissioned in 2006, the elementary school was to be a highly sustainable and innovative education center built to reflect the natural topography as it relates to its setting. 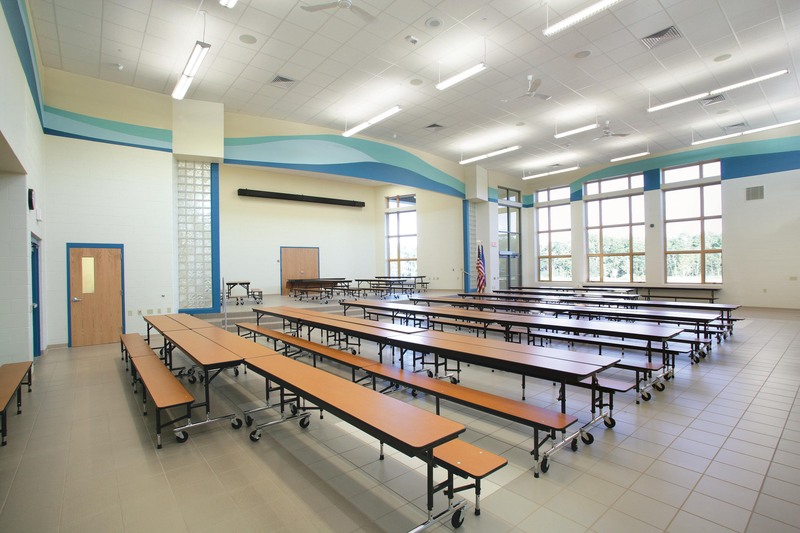 With an environmental theme that reflected the school district’s vision of a sustainable learning environment, River Crest Elementary created healthful, day lit spaces, improved energy and water efficiency, and decreased operational costs all the while emphasizing environmental education. Hoffman Planning, Design & Construction, Inc., a Total Project Management firm, made it their mission to achieve one of the district’s primary goals – becoming a sustainable model for the community. For several years educational facilities have followed the guidelines consistent with the LEED® Silver level. Going for Gold in the new LEED for Schools Rating System introduced restrictions that challenged even the most creative of experts. Having seen assorted glass block patterns used in a divider wall at a Thai restaurant in Madison, Wis., Catherine Cruickshank, Senior Project Designer at Hoffman, was inspired to experiment by twisting and turning the glass blocks to create waves and ripples consistent with the River Crest theme while achieving a balance between daylight and privacy . Pittsburgh Corning glass blocks enabled the elementary school to overcome the prerequisite challenge of acoustics to ensure classrooms are quiet enough for learning, and earn a LEED Gold certification. Glass blocks also increased sustainability by letting in more light and reducing energy costs, while still maintaining needed privacy. Three different, highly sustainable patterns of glass block were used: DECORA®, SeaScapes® and SPYRA® patterns. The basic material that makes up glass blocks will last forever and are made to compliment the building’s neutral theme. 1. 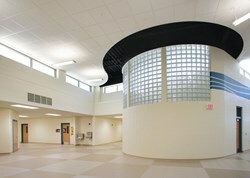 In the main foyer, SPYRA® pattern glass blocks create waves introducing light from the windows in the guidance office, nicknamed the “lighthouse” by the students. 2. The SeaScapes® pattern was used in the story area of the library to borrow light from an adjacent window. 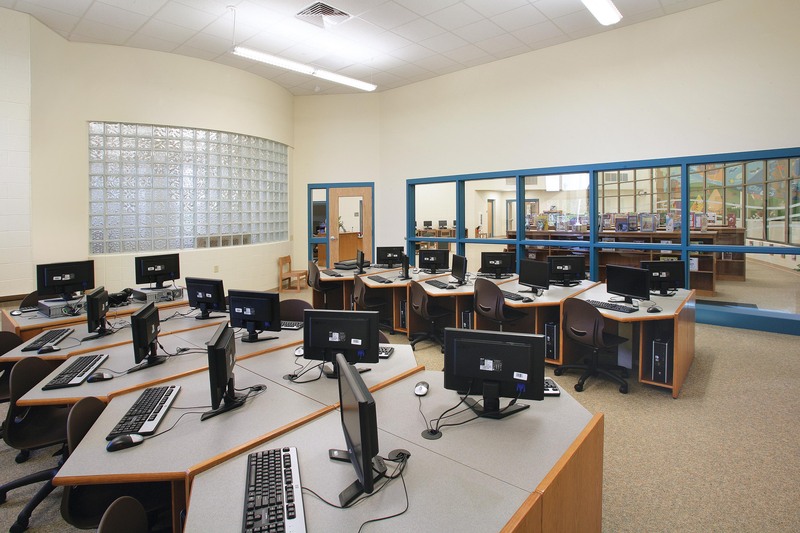 For symmetry, glass blocks were used between the story area and the adjacent computer lab. 3. The SPYRA® pattern was used to create a ripple pattern in the cafeteria to frame the opening to the platform. The teachers like it for supervision as they can tell if a kid is hiding behind the wall. River Crest Elementary earned the esteemed Leadership in Energy and Environmental Design (LEED®) Gold designation from the U.S. Green Building Council. With this designation, River Crest became the first elementary school in Wisconsin, and just the second public elementary school in the nation, to receive Gold under the LEED for Schools Rating System. Thanks to the expert architects and their work with Pittsburgh Corning glass block, River Crest Elementary reduced their construction cost by $57/sq. ft., 29% below the average cost for public elementary schools built in Illinois, Minnesota, and Wisconsin in the same year. “The final ‘wow’ for the community members was when the cost per square foot was beneath the area cost per square foot of conventional construction – not even green construction. That was the extra ‘wow’ that people in the community were thrilled about. We wanted our community, our taxpayers, to know that they were getting a great value for their investment,” says Mary Bowen-Eggebraaten, Superintendent, Hudson School District.